Ben Brown believes Sussex can end a season of fluctuating fortunes on a high as they target runners-up spot in Division Two of the Specsavers County Championship. Essex could be crowned champions and claim the only promotion spot by beating Glamorgan this week but Kent, Sussex and Worcestershire are all vying for second place. Sussex meet the Pears at Hove starting on Monday buoyed by a two-day win over Leicestershire at Grace Road last week, their third victory in their last four Championship games. Their innings success helped erase the memory of a heavy defeat to Kent in their last home game. Brown, who will lead the side for the remainder of the season while Luke Wright recovers from an arm injury, believes Sussex are heading in the right direction – but admits giving young players their chance, as they have done this season, can occasionally be frustrating. 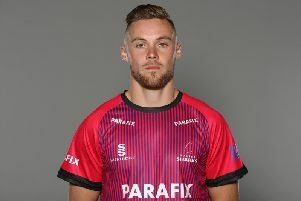 “We had quite a young team out against Leicestershire again and I think that when you play youngsters there will be some good weeks and bad weeks. “But I thought it showed a lot of character to bounce back in the way we did after such a heavy defeat against Kent and win in two days. It’s not going to be perfect sometimes but overall, with the way some of the youngsters have come through, we are building something and heading in the right direction. Sussex showed their faith in youth again last week when Harry Finch was awarded a new two-year contract. Finch, who will spend the winter working with highly-regarded Australian batting coach Trent Woodhill, is out for the rest of the season with a broken thumb but Sussex will have Chris Jordan available against Worcestershire. Steve Magoffin needs one wicket to reach 50 wickets for the fifth successive season while the in-form Brown (693 runs) and Luke Wells (784) know that they could join Chris Nash and Ed Joyce in reaching 1,000 runs with good finishes. Sussex complete their campaign against Gloucestershire at Bristol next week.